Your path is the vessel. My guidance and expertise help you decipher the messages the tarot cards offer and understand the most effective ways to move forward with the knowledge and insight you receive. 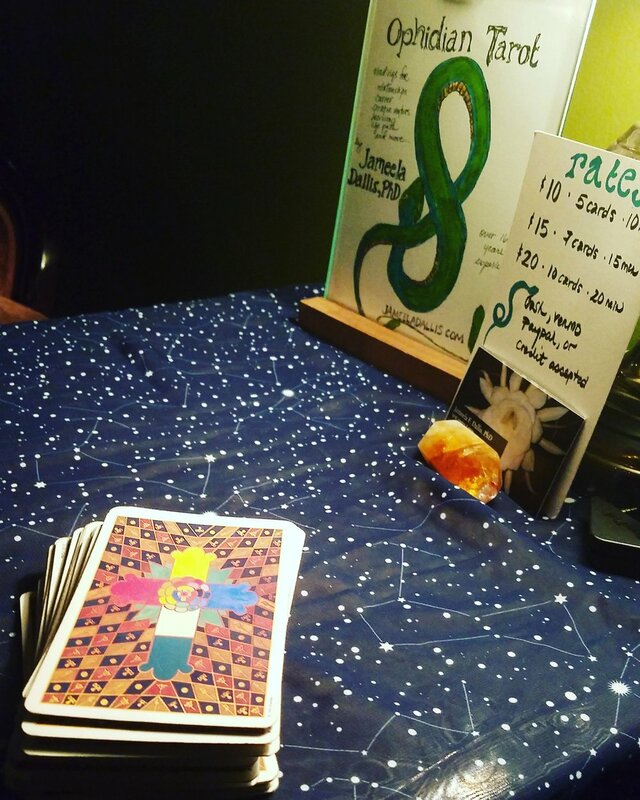 Tarot readings for individuals, couples, Coworkers, groups, and events. Tarot is a mirror that reflects our present and provides insight into our past. It is a tool that provides direction rather than revealing a future to which we are bound, because we have free will. Encounters with tarot can help us see ourselves more fully, help prepare us for what's ahead, and help us make more beneficial future choices. I've helped clients gain perspective on relationships, their careers, work through creative blocks, consider the rewards and challenges of beginning a new path, and so much more. I've also helped couples, business partners, and groups of people working on creative projects understand their paths and processes together while valuing each individual's background and unique perspective. I have been studying and reading tarot for over sixteen years and have read for hundreds of people. My interpretive style is intuitive and experiential, poetic yet direct. I look forward to reading for you. Learn more below or skip to view Arcana rates, in-home and Skype rates, or event rates. Ophidian denotes serpents. In many cultures and symbol systems, serpents symbolize transformation, change, creativity, and renewal. Ophidian is an apt moniker for the way I practice tarot. Tarot is a tool for reflection and transformation. I've been reading tarot regularly at Arcana since the underground bar and lounge opened December, 2015 in Durham, NC. Readings at Arcana are provided on a first-come, first-served basis. On nights when I'm scheduled, I read from 8pm (or 8:30pm on Wednesdays) until midnight (at least!). At Arcana, I offer readings for $10-$15-$20 (for individuals) or $20-$45 (for couples). I accept cash, Venmo, PayPal, or a major credit card (except Discover) for payment. Private readings provide more time for us to reflect on your current situation, explore questions about your next steps, and any number of concerns. Let my experience and creative, intuitive approach work for you. Click "Learn More" below to see full details and rates. Rates begin at $45 for an individual 30-minute reading in my home or via Skype. Rates for an individual reading at your home begin at $75 (45 minutes). I accept cash, Venmo, PayPal, or a major credit card (except Discover) for payment. Use the contact form to schedule a private appointment, or call 919.907.0718. I'd love to read tarot for you and your guests at your next event. I've read tarot for guests at The Carrack's Muse Masquerade, the North Carolina Museum of Art's ArtScene, art openings, and more. I've also read tarot during several celebrations, birthdays, and dance parties at Arcana. Rates for special events begin at $150/hr for 11+ guests. In lieu of an hourly rate, you can book me and I'll charge my own rates. Click "Learn More" below to see full details and rates. Interested? Learn more about details below, contact me, or call 919.907.0718 for availability. I accept cash, Venmo, PayPal, or a major credit card (except Discover) for payment. May 4: Hyperspace Hoopla at The NCMA. Details TBA. March 10: Take Up Space: Women’s Weekend at the NCMA. Complimentary tarot Readings from 11am-1pm and 2-4pm.